One of my girlfriends has been bugging me to try Shogun out for a while now, as she frequents it alot. We made last minute reservations for a large group and they were kind to accomadate us for a group birthday party. Being close to downtown, it was nice that there was free parking in a cramped underground lot less than a block away for customers. The bland exterior hides a dimly lit dark wood panelled richly decorated Japanese style sitting areas - all partitioned off with paneled walls. Guests can leave their footwear before sitting in the sitting areas, or sit around tepanyaki grills depending on what you feel like eating. Being a large group, we stick to reviewing food that we could reach on our portion of our own table rather than try to eat almost the entire menu which our group eventually ordered lol! We went with the standard green tea, some hot sake and Japanese beer to wet our appetites while we peruse the menu. 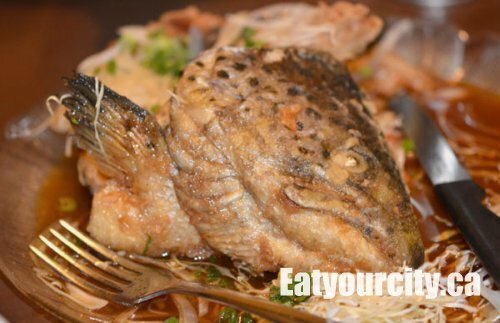 There's a wide range of cooked foods, interspersed with smaller snacking dishes and a small selection of sushi rolls, sashimi and sushi. We start off with one of our favourite Japanese dishes - thinly sliced beef served with ponzu sauce and garnished with whatever the chef prefers. 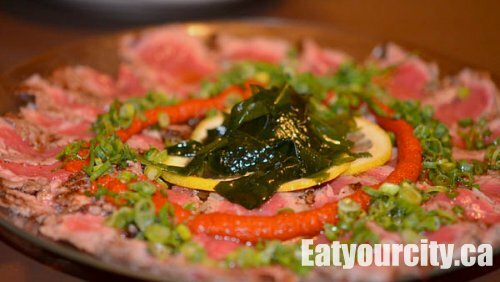 In this case, the beef was sliced thin, though Shogun should have used a nicer cut of beef as one of our meatatrians who loves beef sashimi, scrunched up his face at the grainy mouthfeel. The sashimi was sitting atop shaved raw onions in a puddle of sweet ponzu sauce, with a clump of kelp and lemon slices in the center. There was a strange thick circle of red sauce on the sashimi which turned out to be a generic hot sauce. The hot sauce was extraneous, cloying and depite picking off the thick chunk of it, enough of the hot sauce remained on the sashimi pieces to completely obscure any delicate or subtle flavors... so you end up eating a smushy rough clump of hot sauce. The pieces lucky to be free of the hot sauce was much more palatable. The sunomono is a favorite starter salad of mine comprised of clear glass noodles swimming in a tangy sweet rice vinegar based dressing. 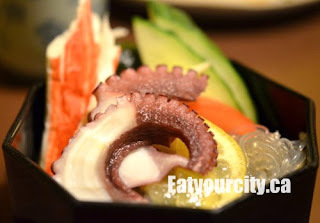 Shogun's Tako version included two pieces of slightly overcooked chewy blanched octopus pieces atop springy clear glass noodles. Two huge pieces of simulated crab meat peeks out of the noodles along with a few pieces of cucumber. The dressing is a bit more on the sweet side than tangy acidic, but tasty none the less. These little lightly battered squid pieces were marinated in sake before its date with the deep fryer and served with a ponzo based dipping sauce. 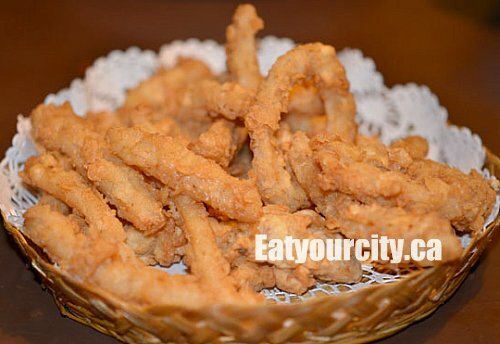 The sake marinade added in a subtle addictive flavor to these crispy perfectly cooked calamari pices. The slighty spicy ponzo based dipping sauce (not shown) wasn't really required as the lightly battered calamari was crispy, and flavorful enough to hold its own. 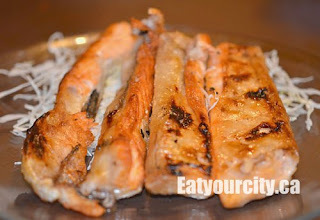 You might be thinking, why on earth do you want to eat salmon belly? Well, same reason why the pork belly is considered gold in the culinary world. The belly meat is the fattiest (think flavor baby!) and most tender large section whether its on a piggy or fish. In salmon's case, the belly is melt in your mouth tender as the fatty fish cooks itself in its own oils. Shogun's BBQ was a little bit too hot and blackened the skin for about half the pieces that was seasoned with a touch of salt. The tender fish was served with a honey mustard based dipping sauce that worked well with the salmon belly, not overwhelming but adding nicely to the fish belly, by cutting through a bit of the richness. 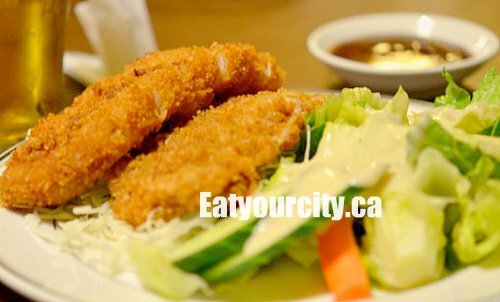 Described on the menu as Japanese style deep fried pork cutlets, these two lightly crumb seasoned battered cutlets sitting on a bed of shredded cabbage were fried to prefection - with the meat seasoned, juicy and tender. The cutlets didn't really need the accompanying dipping sauce, but the tanginess of the sauce helped cut through the grease of the deep fried goodness and worked well with the cutlets. It was served with a green salad of torn iceberg lettuce, carrots, cucumber and topped with a light dressing to round things out and helped make this dish a tinny bit healthier. When it comes to sushi, we're a bit of sushi snobs in the sense we strongly believe that well seasoned and formed rice combined with impeccabley fresh and well cut sashimi elevates the humble sushi to something greater than a sum of a piece of sashimi and a clump of rice. Sadly, Shogun falls a bit short on both parts. We ordered the sake (salmon), maguro (tuna) and hotate-gai (scallop) nigiri. All the seafood while fresh, wasn't impeccabley so. The salmon, tuna and scallop were acceptable, but missing the classic subtle sweetness only present when the seafood is amazingly fresh. The sushi rice was disappointing as there was barely any discernible rice vinegar and seasonings, and acted as a bland foundation rather than one that integrates and brings out the flavor of the seafood atop of it. Overall, Shogun needs work in their sushi/nigiri department before I would return specifically for the sushi. However, they have a good showing in the appetizers and cooked foods side of the menu, and have a good sense of creating and pairing unique sauces with dishes, so its worth a visit if you're not too picky about your sushi. For some reason the picture of the beef "sashimi" looks on the lines of beef tataki, given it looks seared before sliced. Technically, the topping on the shari (the rice on a nigiri sushi) is called neta. Having said that, how was the texture of the fish? Given most of the seafood is frozen, I would be more concerned it is thawed correctly. And, since Edmonton is a land-locked city, I have accepted a little bit the fact it might not be "fresh". Hey KimHo, I totally agree the "beef sashimi" is beef tetaki - but that's what Shogun calls it on their menu. We got a blank look on our waitress's face when we ordered it "incorrectly" as tekaki. Technically all seafood made into sashimi or sushi has to be frozen using a commercial grade freezer to kill any unwanted parasites (at least in Canada), the quality of the seafood before freezing, freezing and thawing process is ooper important. 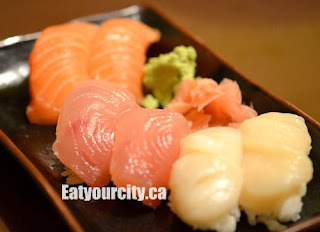 That said, we've had good nigiri and sashimi in Edmonton - silky, melt in your mouth with the characteristic ocean sweetness you only find when the seafood started out amazing and was prepared well... at Shogun, we found the seafood portion wasn't as on par as say Sushi Wasabi. The fish specifically was a touch fishy, lacking the "crisp" mouthfeel and slight springiness in the flesh. The scallops left a weird slight gumminess texture after you swallow and lacking the lovely sweetness it usually has. As for sushi and sashimi, may I ask what are your suggestions? No worries, I have just enough Chinese in me to eat chicken feet, love tripe and cow heart, but not quite enough for me to not to get squeamish when it comes to blood pudding. Borrowing your terms... For landlocked Edmonton, the best sushi and sashimi would probably be at Sushi Wasabi. The service is a bit slow at times, but most consistently fresh neta and well composed shari. Shogun I'd probably only return to for their decent selection of cooked items. For Calgary, I'd say Wa's is your best bet for sushi and sashimi. Places like Globefish is a bit too Westernized and "fusiony" for them to really focus on what matters - the sushi and sashimi. Oops.. I had skimmed right over the last blog post and went straight to the archived stuff :P After reading your parting sally, I'm sad to see the Vancouver blogscape has degenerated to this point... its been a growing trend over the last little while, though I don't follow as many blogs and writers as you do.. I didn't realize it was so prevalent and pervasive. Blogging anonymously (and declining invites and offers not offered to the public) is hard on the wallet, but ethically, the way to go. We're here for the food and telling the world what experience they should expect, not a biased or "paid off" version. I hope you start blogging again, if for nothing else, to put a stick in dere eyes.. a voice of clarity can cut through the background noise. And yes, I'd love to hear what you, Sherman or Minjune recommend for traditional Japanese in Vancouver... there's a derth of resturants out there that claim it like Tojos, only for us to find out whoops, we're at the "California-fusion" location Bah!